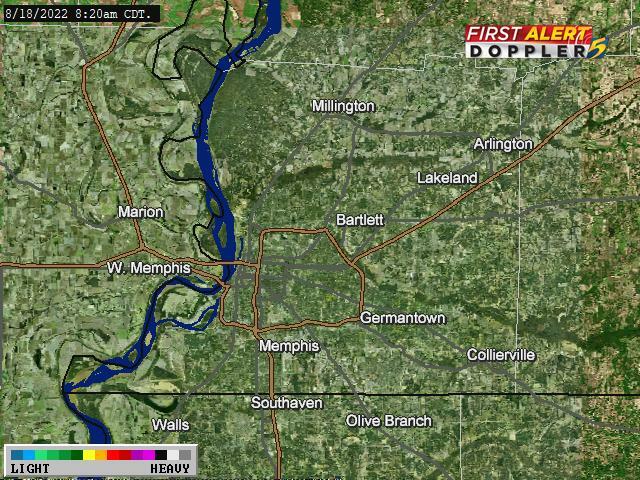 MEMPHIS, TN (WMC) -Showers and a few thunderstorms will move in near midnight. The overall severe weather threat is low but there could be a strong storm or two with the biggest threats being, gusty wind, hail, and frequent lightning. A low-pressure system and cold front will slide across the Mid-South tonight and early tomorrow keeping rain chance elevated through Monday morning. TONIGHT: Increasing clouds and a 60% chance of showers and storms. Winds: South around 5 to 10 mph. Low: 56. MONDAY: Showers early then mostly cloudy with a 30% chance of showers. Winds: West around 5 to 15 mph. High: 64. MONDAY NIGHT: Mostly cloudy. Winds: North at 10-15 mph. Low: 44. THE WEEK AHEAD: The rest of the week will feature more sunshine on Tuesday but cooler with afternoon highs in the upper 50s and overnight lows dipping into the 30s. Temperatures will rebound a bit on Wednesday as highs will return to the middle 60s along with sunny skies with overnight lows in the upper 40s. Thursday highs near 70 degrees with partly cloudy skies and lows in the 50s. We are tracking our next system on Friday and into the weekend. There will be chances of showers and storms Friday. Highs will top out near 70 with lows in the upper 40s. NEXT WEEKEND: Saturday our next system could bring rain on Saturday and possibly early Sunday along with a few storms to the Mid-South. Highs in the mid 60s Saturday with lows in the mid 50s and Sunday highs in the mid to upper 50s and lows in the low to mid 40s.